RESTYLANE® was added to our list of cosmetic procedures in August, 2004. RESTYLANE® is a pure, synthesized form of hyaluronic acid, the substance that is naturally produced by your skin to provide fullness and maintain form. As our hyaluronic acid layer degenerates with age, wrinkles begin to form around the mouth and lips. The lips themselves begin to lose shape and fullness. 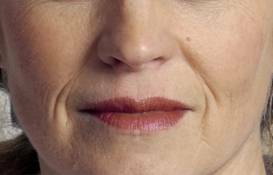 By reintroducing this layer through the injection of RESTYLANE®, we can greatly reduce the appearance of nasolabial and radial “smoker’s” lip lines, as well as enhance the shape and fullness of the lips. This hyaluronic acid dermal filler is non-toxic and non-allergenic. It can last 8 months to two years. The injections can be rendered painless in most cases with topical and local anesthesia. Rejuvenation lasers, the laser peel, and small amounts of Botox® have been complementary tools in smoothing lines from around the mouth area. Find out how to best address your specific concerns. Call us at 415-925-8888.